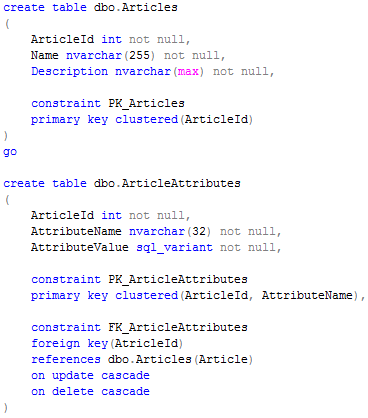 Last time we discussed 2 design patterns that can be used when you store custom attributes in SQL Server database. Today I’d like to talk about another pattern known as Name/Value pairs and sometimes called as Entity-Attribute-Values. Could be inner join, could be outer – depends on the situation and design. But besides a lot of joins there is another problem. Developers are lazy. Everytime they need to write the statement like that, they would use cut and paste (see the nice red undeline above). And you can imagine amount of errors it could introduce. Unfortunately that would not solve the problem when we need to sort/page/filter by the attributes nor, more importantly, help us with reports. And customers demand reports. As you probably noticed, I replaced Attribute Name with Index. This will add a little bit more complexity to the code but same time it saves us storage space. We are going to save a lot of records in that table. And that’s usual “It depends” question – is additional complexity worth that. There is also very good idea to keep some kind of “Metadata” table that stores some information about attributes and types. This is essential in case if you store attribute indexes but it also helps even in case if you store Attribute Names. As you can see this introduces the plan with a lot of joins and quite a lot of IO. 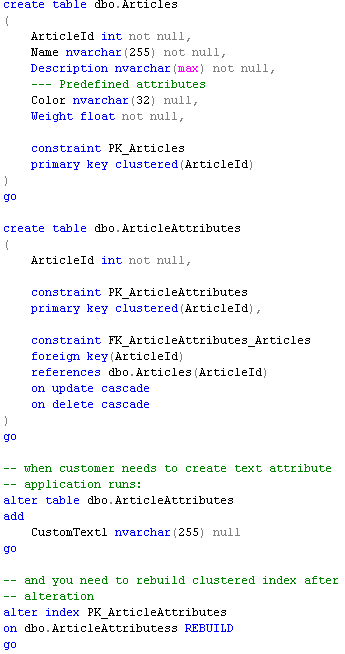 Now let’s try to reshape the query to use PIVOT. As you can see – that’s far far better. You can play with the shape of the query if you want to change execution plan – for example approach below gives you nested loop instead of merge join. As you can see the difference in IO is dramatic. Let’s play with a couple other scenarios. What if we want to search for specific value in one of the attributes? Well, we need to create the index in such case. The biggest problem here is the size of the key. With index it cannot exceed 900 bytes. Value (which is SQL Variant) can go far above that. So we basically have 2 choices. First either do not include Value to the index (or have it as included column) or perhaps, use filtered index and disable the (index) search for some fields. Even if first option does not look very promising, there is one thing to consider. Are there any other criteria for the search? 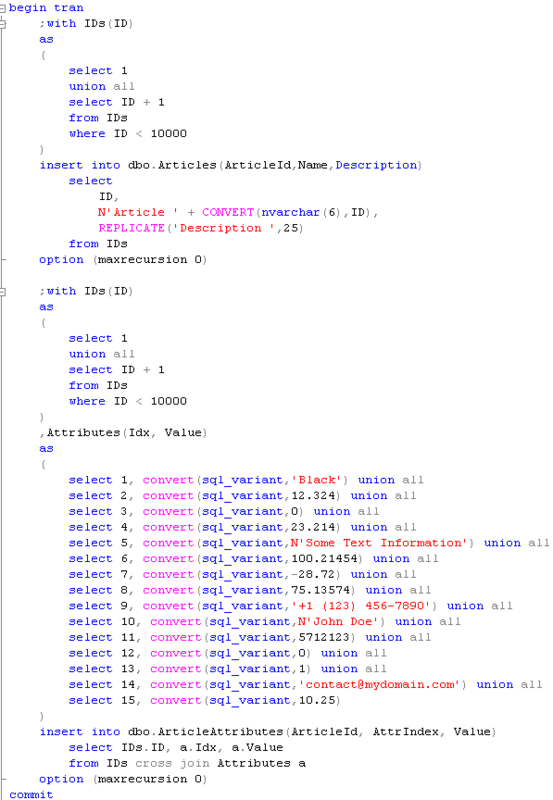 If all your use cases include some additional columns in the query it could make sense to push those columns to Attributes table and make them part of the index. As the real-life example, assuming you’re collecting data and all your queries include time range. In such case you can push ATime column to Attributes table and make the index as (AttrIndex, ATime) include(Value). While it uses the range scan, it could be acceptable because of additional filter on ATime that limits number of records. Multiple schemas support – Yes. Online schema change. Yes. 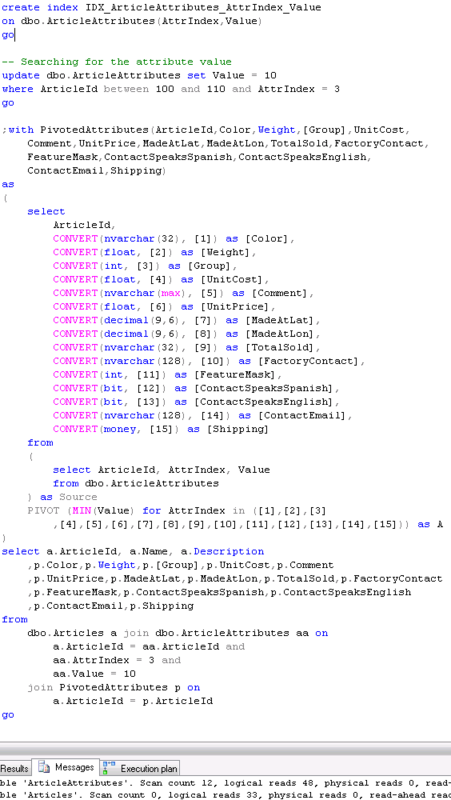 Although if customer needs to be able to change data type of the attribute some work is required. Sorting/Paging friendly. Same as above. And the last one is the biggest limitation of the design. While it offers very good performance, you have to babysit the solution. You need to think about use cases to design queries and indexes. You need to maintain indexes – you’ll get excessive fragmentation there. P.S. I want to thank Vladimir Zatuliveter (zatuliveter _at_ gmail _dot_com) for his help with preparation of this post. 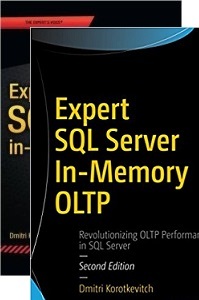 This entry was posted in General, SQL Server 2005, SQL Server 2008, T-SQL on February 22, 2012 by Dmitri Korotkevitch. This entry was posted in General on February 21, 2012 by Dmitri Korotkevitch. Regardless how good and flexible the system is, it’s practically impossible to design it in the way that satisfies all customers. Don’t take me wrong – if you have internal development team that works on internal system, you could be fine. But as long as you start to sell the solution or, even better, design the hosting solution for the multiple customers – you are stuck. There is always some customization involved. One of the very common examples of customization is custom attributes customer wants to store. 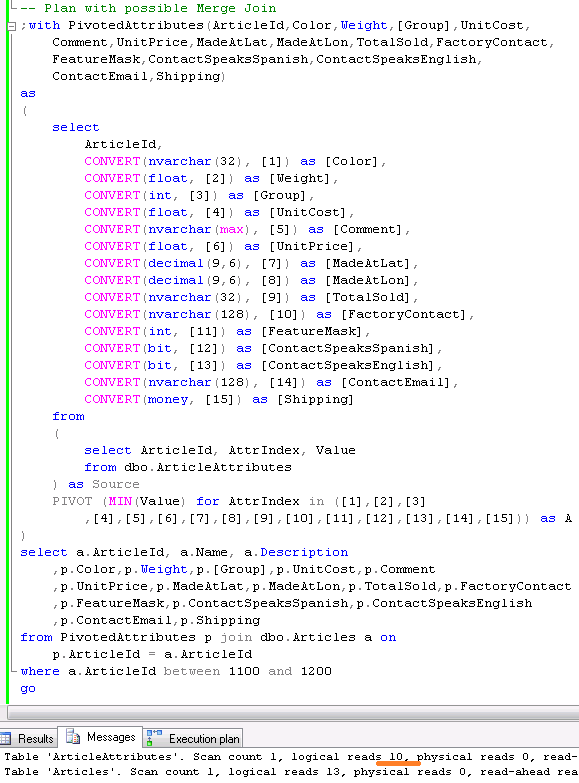 For example, let’s think about shopping cart system and Article table there. If you put some time trying to define Article attributes you can end up with quite extensive set. Size, Weight, Dimension, Color.. So far so good. But one day sales department close the deal with auto part store and now you have to deal with cylinders, trim types, engine, battery amp-hours and other funny stuff. Next day the company closes the deal with grocery store and you have to deal with nutrition information. We will do some performance testing and storage analysis for those approaches. Expandability. Does solution offer unlimited expandability in terms of numbers and types of the attributes? Online schema change. E.g. can schema be modified online with active users in the system? Storage cost. How much storage solution requires? Upfront knowledge of the data schema. What client needs to know about attributes while selecting data. And before we begin, as the disclaimer. I’m going to show a few patterns but by any means there are other solutions available. Every system is unique and you need to keep your own requirements in mind while choosing the design. Not the best pattern in general could be the best one for specific system and specific requirements. As you can see, I mentioned that rebuilding of clustered index is the good idea. It reduces the index fragmentation due increase of the row size. And if you drop the attribute, you’d need to reclaim the space. 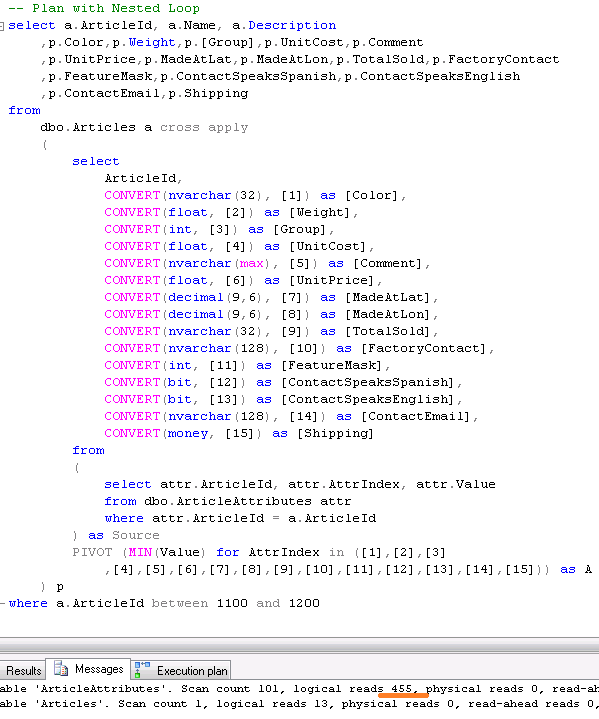 Multiple schema support. 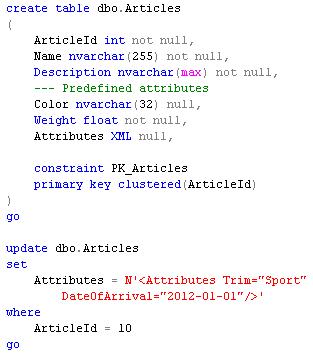 It would work with the multiple schema if/when you have predefined set of the attributes (1.a) from above. Of course, in that case all customers will have the limitation on maximum number of attributes per type but it could be acceptable in some systems. In case if you dynamically alter the table only one schema could be supported. 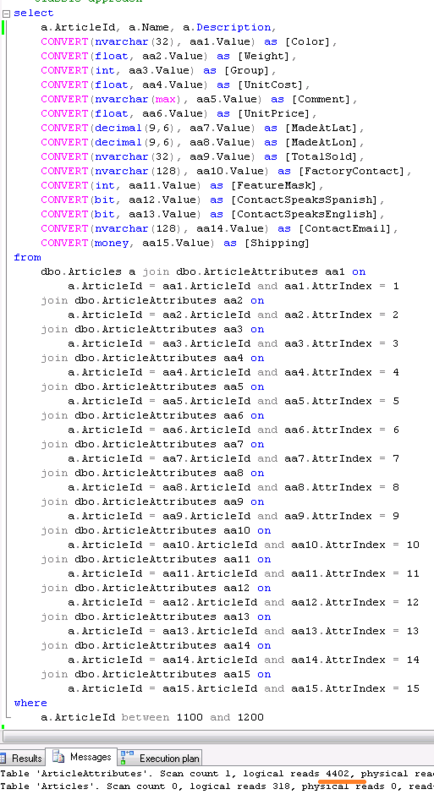 Of course, you can do some tricks with that – for example keep multiple tables (one per customer) or reuse the attribute columns created by other customers but either of those approaches would introduce a lot of complexity and management overhead. It’s simply not worth it. Expandability. 1.a obviously is not expandable. At least automatically. 1.b and 1.c offer practically unlimited expandability (subject of SQL Server limitations on max row size and max number of columns). Online schema change. 1.a does not require any physical schema changes. 1.b and 1.c require SCH-M lock acquired on the table during table alteration (which is basically exclusive table access) as well as user should have appropriate rights to execute the ALTER TABLE statement. Storage cost. 1.a – it increases the size of the row in Articles table by the size of all fixed-width data types used by attributes plus at least 2 bytes per variable width attribute regardless if attributes are used or not (see it in more details). This could be OK as long as the table is not transactional (does not store a lot of data) and we are not going crazy with total number of attributes we predefined, but still – it needs to be considered. Row size matters. 1.b and 1.c are much more efficient in that regard – attributes are created only when needed. Search-friendliness. 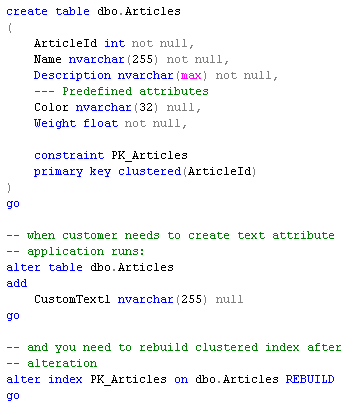 Generally this would introduce the search clause like: where (CustomText1 = @P1) or (CustomText2 = @P1) .. Usually those patterns lead to clustered index scans unless there are predicates selective enough to utilize non clustered index. So this is more or less the question if system even need to allow search like that without any additional filters on other columns. One other thing to keep in mind – you need to be careful dealing with various data types and possible conversion errors. Sorting/Paging friendliness. That pattern is extremely friendly for sorting and paging as long as there are some primary filters that limit number of rows to sort/page. Otherwise attribute either needs to be indexed or scan would be involved. Upfront knowledge about the data schema generally is not required. While select * is not the best practice, it would work perfectly when you need to grab entire row with the attributes. The biggest benefits of that design are simplicity and low access cost. I would consider it for the system that require single data schema (box product) or when multiple data schema would work with limited number of attributes (1.a). While it can cover a lot of systems, in general it’s not flexible enough. I would also be very careful with that pattern in case if we need to add attributes to transactional tables with millions or billions of rows. You don’t want to alter those tables on the fly nor have storage overhead introduced by predefined attributes. 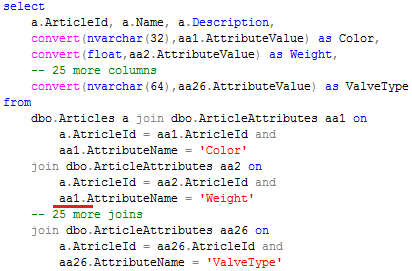 One other possible option is to use SPARSE columns with 1.a and 1.b. SPARSE columns are ordinary columns that optimized for the storage of NULL values. That will technically allow you to predefine bigger set of the attributes than with regular columns without increasing the size of the row. Could be very useful in some cases. 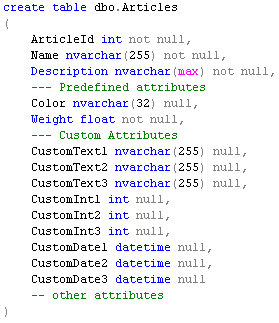 Same time you need to keep in mind that not null SPARSE column takes more space than regular column. Another important thing that tables with SPARSE columns cannot be compressed which is another very good way to save on the storage space. And the last note about the indexing. If you need to support search and/or sort on every attribute you need to either limit the number of rows to process or index every (or most commonly used) attributes. While large number of indexes is not very good thing in general, in some system it’s perfectly OK (especially with filtered indexes that do not index NULL values), as long as you don’t have millions of rows in the table nor very heavy update activity. Again, this is from “It depends” category. Online schema change. Easy. There is no schema on the metadata level. Well, you can, of course, define XML Schema and it will help with performance but again, consider pros and cons of this step. Attribute access cost. Heh, and this is another big one. That’s great that SQL Server has build-in XML support. But performance is far from ideal. 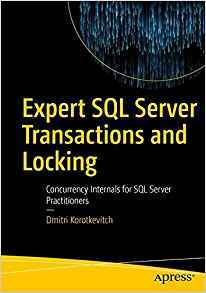 We will do some performance testing in Part 3 of our discussion but trust me – shredding XML in SQL Server is slow and CPU intensive. Search-friendliness. Well, you need to shred it before the search – it’s very slow. XML Indexes would help but it’s still slower than regular columns and introduce huge storage overhead. Sorting/Paging friendly. Same as above. You need to shred data first. Upfront knowledge about data schema. All data stored in 1 column. So client does not need to jump through any hoops to access the data. But of course, it needs to know how to parse it. 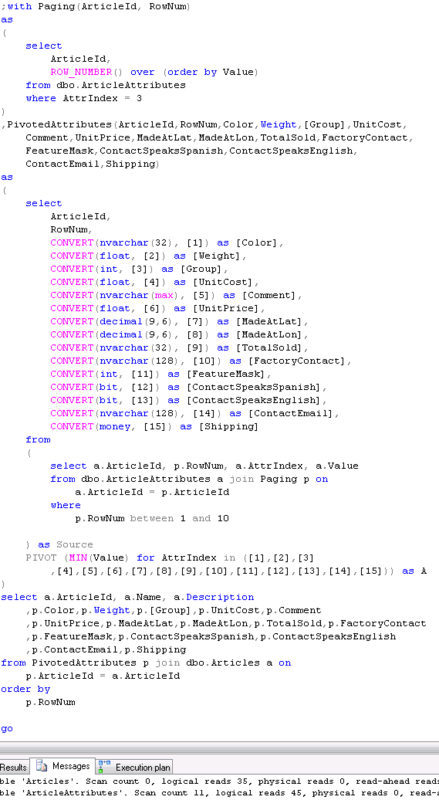 Bottom line – storing custom attributes in XML is the perfect solution in terms of flexibility. Unfortunately it’s very storage-hungry and most importantly very slow in terms of performance. That solution is the best if the main goal is simple attribute storage and displaying/editing very small amount of rows on the client. For example Article detail page on the web site. Although if you need to shred, sort, filter the large number of rows – you’ll have performance issues even with XML Indexes. Next time we will talk about Name/Value table that deserves the separate post. 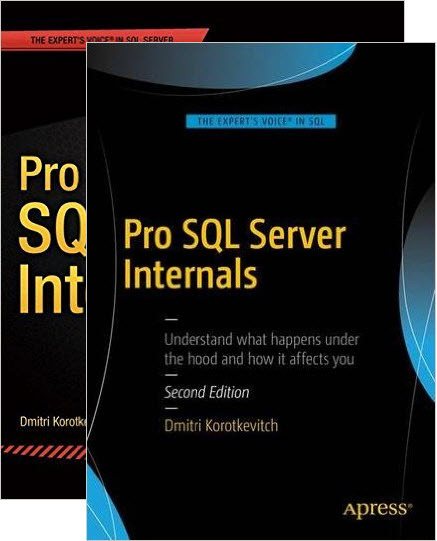 This entry was posted in General, SQL Server 2005, SQL Server 2008 on February 1, 2012 by Dmitri Korotkevitch.